"Any other innings this summer you could say 'well, it’s not easy being an opener' but in this particular Test match I don’t think he's done himself any favours." At the top of the order, a week ago if you'd asked, I'd have wanted Keaton Jennings in Sri Lanka. I think he's a very good player of spin, he's a good guy but he's fluffed his lines. That could be it. Two soft dismissals in this match, poking it round the corner to leg slip in the first innings and then against a skiddy, around the wicket bowler, coming in, to just leave the ball is dangerous. It's just not smart cricket. I think he's vulnerable. Any other innings this summer you could say "well, it's not easy being an opener" but in this particular Test match I don't think he's done himself any favours. I think they'll want to take him because the lad at the other end is retiring. That's the point really, you don't realise how good Alastair Cook is until he's gone. He's got nine hundreds in the subcontinent, he's a phenomenal player of spin and they're going to a place that is going to spin. Not only are they going to replace him, they might need to find someone at the other end as well. The thing with Sri Lanka being the next tour is that you don't need to worry if they're openers or not because it's going to spin from ball one, so just pick your best six or seven batsmen and don't worry if they're openers or not. That said, I'd pick Rory Burns. I think he's got enough runs to tell you that he deserves his chance, every one of the last four or five seasons he's got runs, most of them in first division cricket. But there is no guarantee, they've tried 12 already since Andrew Strauss - there is no guarantee that the next one or two will be able to do it. I know he got out to spin today, a beautiful delivery, but I think Moeen Ali can bat at three away from home, I think he's a bit loose to bat there in English conditions. Ravindra Jadeja got him and he had a very good day. It would be the easy thing to say that India should have picked him earlier in the series but how many people were saying they should pick him in those first four Tests? I don't know how they'd have got him in. It's all well and good being wise after the event but Ravi Ashwin is a brilliant bowler to left-handers, England have an abundance of left-handers so you'd have been a brave man to turn up at Edgbaston and leave Ashwin out. What you could have done is played two spinners but then which seamer deserved to be left out? Mohammed Shami? No. Ishant Sharma? No. Jasprit Bumrah? No. Maybe in the first game where Umesh Yadav played they could've gone with two spinners. He's a very fine cricketer and in the last game at Southampton, if they didn't think Ashwin was fully fit, they should've played Jadeja. With all that rough that was there, he would have been a handful. Jadeja gives that extra bit of batting strength as well, as he showed today. I thought it was a little bit odd that England took the new ball when they did though. Ali was bowling well, he and Adil Rashid had just got a couple of wickets between them and suddenly you decide to take the new ball. It means you've only got one way to go, you have to go to your seamers really. I felt Joe Root could have gone with Ali for a few more and I didn't think England were smart in the way they didn't keep Jadeja off strike. That was more to do with the bowlers and hiding the ball with the last ball of the over, Jadeja kept finding a single to get back on strike. You have to give credit to Jadeja as well, the way he went into one-day mode and started smashing it. I think this pitch will turn and batting last, as we've seen in this series when they have had to chase two relatively small totals, certainly not massive totals, India have struggled. If England get their lead up past 250, pushing 300, on a fourth or fifth-day Oval pitch then they'll feel they've got enough. There's movement for the seamers still, India's quicks have gone past the edge on a number of occasions, and they'll be plenty in there for Ali. The change of ends helped him today, the foot holes weren't ideal but the breeze was perfect when he was bowling from the Vauxhall End. Then you've got Rashid for the tail, as they often use him, so if they get those 100 or so more runs, it looks good for England. 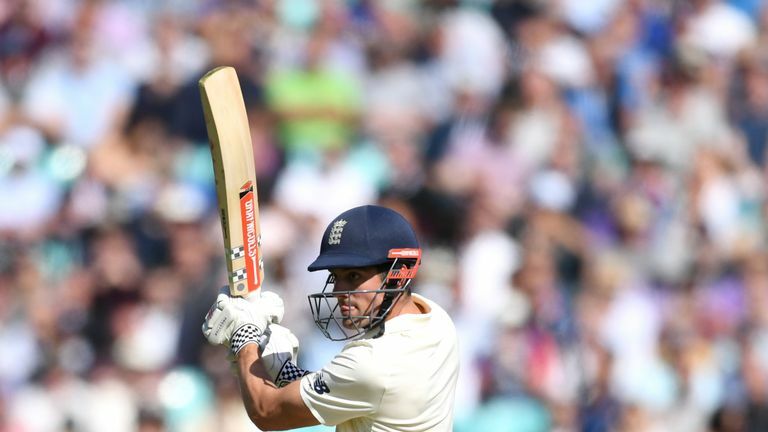 Watch day four of the fifth Test between England and India from 10.30am, Monday on Sky Sports Cricket.